Princess Diana once said: “Carry out a random act of kindness with no expectation of reward; safe in the knowledge, that one day, someone might do the same for you”. One of the reasons I love living in the UK is because for the most part, Brits are some of the kindest, most polite people, I have met. Ever. Throughout my life, I have crossed paths with many kind, gentle souls. Recently, while updating my gratitude list, I remembered an experience I simply must share. One Saturday, I returned an item to the popular clothing store, Apricot. Not finding anything to my liking, I decided to get a credit note. As I was checking out, a very kind woman, waiting in line, asked: “Do you want me to give you cash , and I take your credit note?” I looked at her astounded. For seconds. I quickly pulled myself together, thanked her, and graciously accepted. To which she replied: “It’s okay, I know how credit notes can be” The sales clerk gave her an opportunity to change her mind, by saying “You’re wont be able to exchange the items you are purchasing, with the credit note”. The stranger quietly stated: “That’s okay”. I was in the right place, at the right time. A minute later or earlier, this wouldn’t have taken place. The Lord placed me in the situation for a reason. 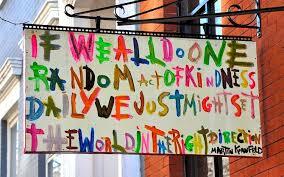 I have done many random acts of kindness before. Likewise, so many people have shown me unbelievable kindness . We don’t often pay attention to them until they have affected in our life in meaningful ways. This was one of those times. It’s left an inedible impression on me. I am very grateful for the kind, thoughtful, and generous people who still walk the earth. Thank you. For affirming my belief the world can still be a beautiful place to live. And the only corner of the universe we can be certain of changing, is the one in which we live.